Three observations from the WAAPP initiative in Côte d'Ivoire. Albert Kangah (center) speaking with journalists about his plantain farm, Plantation Dougba. Africa relies on rain fed agriculture to feed its people and millions of others around the world. Rain, however, isn’t always the most reliable partner in this endeavour. Realisation of agricultural transformation in Africa will need the continent to make some changes. The World Bank, the International Water Management Institute and many others estimate rain fed agriculture coverage in sub Sahara Africa to be greater than 95%. This places a great deal of the continent’s food production at the mercy of temperamental rain and the effects of climate change. Earlier this month, I had the opportunity to meet a farmer in Abidjan’s Azaguiè area who has broken his reliance on rain to feed his family. Albert Kangah is the proprietor of the Plantation Dougba, a plantain plantation dedicated to producing off-season plantain. During regular plantain season, farmers can realize prices of about 100CFA per unit but off season plantain prices rise to highs of 600CFA. By planting 3 months after other farmers have planted and investing in irrigation equipment, Albert exploits the price increase to generate higher than average income from his farm. Albert’s story provides us with an example of the possible positive impact of adopting irrigation on livelihoods and signals the possibilities irrigation provides us in improving food and nutrition security on the continent. This is what agricultural transformation is all about. Albert Kangah is a beneficiary of the West Africa Agriculture Productivity Program supported by the World Bank and running in 13 West African countries. The West African Agricultural Productivity Program (WAAPP) was designed to respond to the challenges of improving agricultural productivity, an important part of any agriculture policy and central to the implementation of the Comprehensive Africa Agriculture Development Program (CAADP). It started in 2008 under the auspices of the Economic Community of West African States (ECOWAS), with financial support from the World Bank (WB) and coordinated at sub-regional level by CORAF/WECARD. WAAPP aims to generate and accelerate the adoption of improved technologies in key priority areas of the agriculture sectors in participating countries. It also aims to provide producers with technologies to enhance and improve the competitiveness of their produce. The generation of technologies and innovations, including new crop varieties, is done through participating national centers of specialization hosted by the national agriculture research centers of the member states. 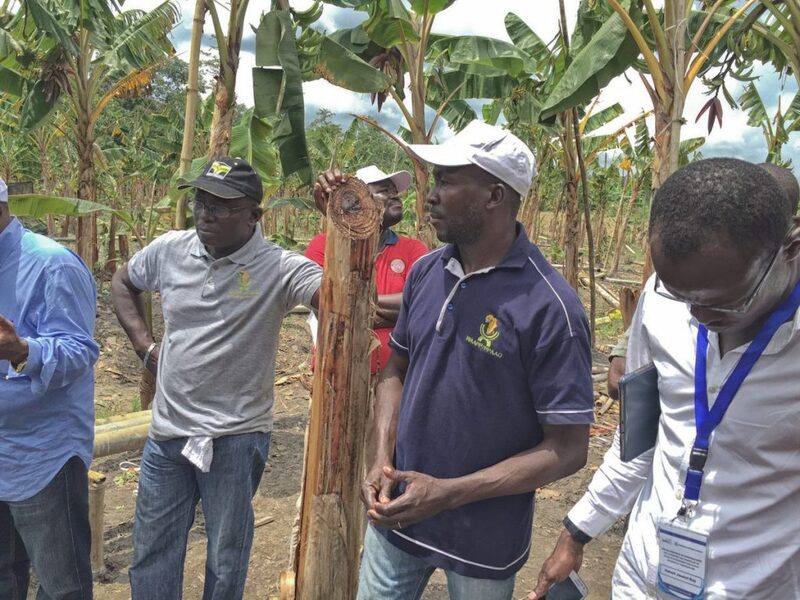 In Côte d’Ivoire, WAAPP’s national center of specialization focuses on plantain with farmers like Albert benefiting from the new better yielding, pest and drought resistant varieties that become available. 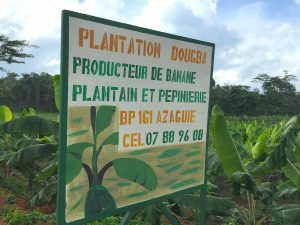 Thanks to the inventory of plantain on his farm, he produces at least 12 tonnes a year. He says plantain changed his life. It’s not hard to see why. WAAPP is also investing in value chain development for the priority commodities in participating countries. One example is the adoption of technology from Senegal through which at least 15% of the flour used in baking bread and pastries is corn or cassava flour. Through an improved manufacturing process, the amount of wheat consumed would reduce while improving the value of cassava and corn for producers through increased demand and new use cases. Establishing partnerships with the Union of Bakery Owners of Cote d’Ivoire has made it possible for the project to expand from the pilot 10 bakeries using the composite flour in Abidjan to more than 50 in Abidjan and two other towns up country. We need to ensure agriculture is a profitable business for Africa’s farmers if it is to become a key driver for Africa’s industrialization. Its profitability will draw young people to the farms and help lower the average age of Africa’s farmers while propelling efforts to reduce hunger, end poverty and reduce inequality on the continent. Investment in research and development cannot be left to happenstance. It must be deliberate and determined by the agricultural transformation strategy in place at the national and regional level. Data from the Agriculture Science and Technology Indicators (ASTI) shows Cote d’Ivoire’s spending, in 2011 PPP US dollars, has reduced by 50% between 1981 and 2011. During the same time the population more than doubled but plantain production did not resulting in lower per capita plantain production in 2011 than 30 years earlier. R&D on better varieties and increased adoption of better technologies could have been useful in avoiding this. They are now imperative to reversing the trend. Increased production without investment in value chains development won’t deliver the added value to small holder farmers at the point of origin. WAAPP’s effort to invest in new use cases for cassava and corn flour could result in better prices and incentivize production whilst improving the nutritional value of pastries in Ivorian society. The work being done by WAAPP partners provides valuable lessons for other regions in the continent especially where value chains development, R&D and regional collaboration on food and nutrition security is concerned. These are some of the elements which are important for CAADP compacts if Africa’s quest for agricultural transformation is to be realised. Next:Comprehensive Source for Agriculture Data on Africa Launched.